HSE Working at Height regulations met. 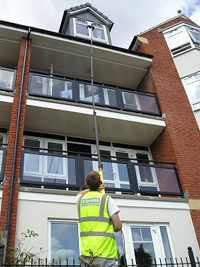 Why is this reach and wash system cleaner than traditional window cleaning methods? Window cleaners usually leave behind a sticky chemical residue, which attracts fresh dirt back to the glass. 100% pure laboratory grade water produces window cleaning results that provides a perfectly sterile finish. No detergent or chemical residue as used by traditional window cleaners methods means that no sticky residues are left, therefore windows do not soil as quickly and the windows stay cleaner for longer. When pure water is used for window cleaning the impurities on the glass are held in the water, as the pure water strives to return to its impure state. The glass is then given a final rinse with the water fed poles to leave the glass totally sterile.